The Burke-Gilman Trail is one of the most popular trails in Seattle. This rail-to-trail pathway stretches almost 19 miles from end to end, and its flat and paved surface is inviting to walkers, joggers, runners, cyclists, and pretty much anyone else on feet or wheels. The trail connects lots of places throughout Seattle so it’s used not just for recreation, but also for commuting and getting around. 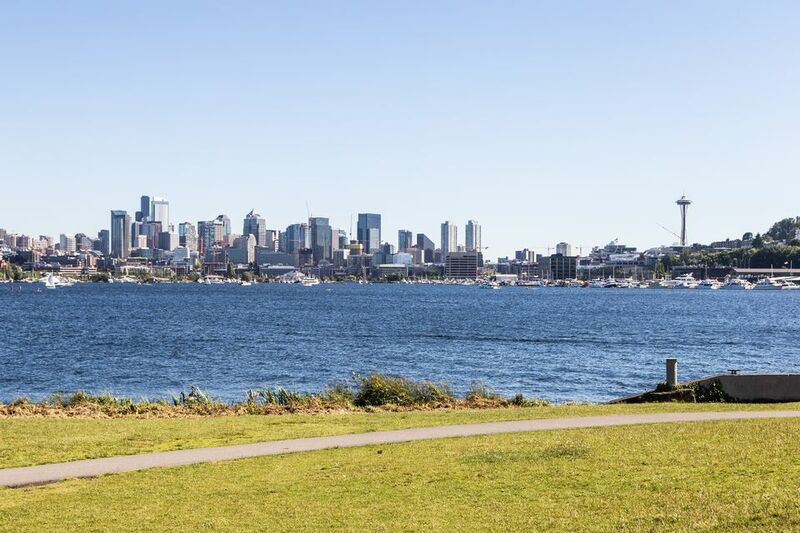 Whether you’re visiting Seattle and want to stay somewhere convenient to the trail or whether you’re looking to get to work on your bike, the Burke-Gilman Trail is useful to know about. Read on to learn details about the trail, where it starts and finishes, and some of the places you can see or stop at along the way. The Burke-Gilman Trail has one end at popular and lovely Golden Gardens Park (8498 Seaview Place NW) and the other end is near Blyth Park in Bothell (102nd Avenue NE near Woodinville Drive and SR 522). After Blyth Park, the trail becomes Sammamish River Trail and continues on to Marymoor Park, so even though it’s not technically the Burke-Gilman Trail, you can keep on going if you’d like. While rail-trails are pretty common in many cities these days, they weren’t always. The Burke-Gilman Trail was one of the first in the entire country and helped kick off other rail-trails by showing how successful they could be. If you haven’t heard of a rail-trail, that’s when an old line of currently unused railroad is converted into a trail. It works great as rail lines are on level, flat ground perfect for multiuse trails. The trail was named for Thomas Burke and David Gilman, both lawyers and railroad builders in the 1880s. By 1890, the line of track was taken over by the Northern Pacific Railway and by the Burlington Northern Railroad in 1970, but then was out of use by trains by 1971. In 1978, the first piece of the rail line was converted into trail. The trail goes through lots of neighborhoods, including Ballard, Fremont, Northlake, the University District, Lake District as well as Kenmore, Bothell, Woodinville, and Redmond. First and foremost, you’ll see a bit of all kinds of people using the trail—commuters dressed for work, people out exercising and people on casual walks or rides. Golden Gardens Park itself is worth a moment. This is one of the finest places to watch a sunset in town and a stellar spot to relax on a nice day. Not far from the missing link is Peddler Brewing Company, a microbrewery that caters to cyclists and has indoor bike parking, a repair station and a pump. Of course, Ballard is known for microbreweries and there are plenty others to try in the area, but if you’re on a bike, you can’t go wrong here. One of the coolest stretches of the trail follows the Fremont Canal, which connects the Puget Sound to Lake Union. Watch the boat traffic go by or stop in Fremont where you can enjoy all kinds of things to do within close proximity, including a Theo Chocolate tour, plenty of restaurants and lots to see like the Fremont Rocket, Vladimir Lenin statue, and the Fremont Troll (turn off at the trail under the Aurora Avenue Bridge and follow Troll Avenue uphill to get to the troll). The trail cuts right through Gas Works Park, which is one of Seattle’s most interesting parks by far. The ruins of a former coal gasification plant remain and make great photos. You’ll also pass through the U District and University of Washington, and the trail is not far from University Village shopping center. If you haven’t already stopped for a snack or lunch, the U District is a fine place to grab an affordable bite to eat and the campus itself is beautiful and scenic to pedal through. You’ll see Husky Stadium as well as Rainier Vista, which offers a pretty stellar view of Mt. Rainier on nice days. You'll also see the Wall of Death as you pass under the University Bridge, but don't worry. It's nothing scary. Just one of Seattle's weirder art installations. After the U District, the trail stays inland and a bit quieter for a few miles before venturing back toward some water again, but this time not the Sound or a canal, but Lake Washington. You’ll pass Magnuson Park on the lake, which is a huge park and former naval station. If you’re traveling the trail with kids, this is a great stop for a huge playground, and if you’re a birdwatcher, all the better because more than 170 species have been seen here. You’ll also pass Matthews Beach Park, which is a great place for a break at the beach or a swim and also on the shores of Lake Washington. You’ll follow along with a view of the lake and lakeside homes as you enter the city of Lake Forest Park. The area past that is a commercial district, but you’ll still pass through a couple lakefront parks to break up the monotony. Just before you leave the shores of Lake Washington, you’ll pass Tracy Owen Station/Log Boom Park, where you can take a restroom break or refill your water bottle. The last stop on the trail is Blyth Park where you can catch a bus back to Ballard or continue onto the Sammamish River Trail. Bonus, if you keep going on the Sammamish River Trail for another five miles, you’ll reach Woodinville Wine Country. There’s a branch off of the main trail at NE 145th Street that will take you to all the tasting room wonderfulness that is Woodinville.